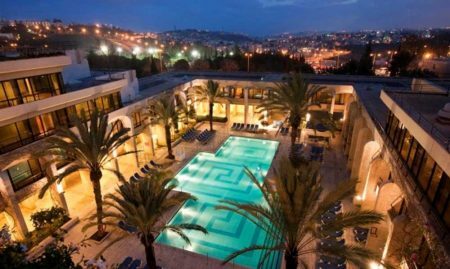 Enjoy an inspirational tour of Jerusalem’s Old City and then a relaxing trip to the shores of the Dead Sea. Give yourself the best of both worlds with an inspirational and educational tour by Bein Harim of Jerusalem’s Old City as well as a relaxing trip to the shores of the Dead Sea. Our first stop in Jerusalem is at the Mount of Olives where we can look out across the ancient city. 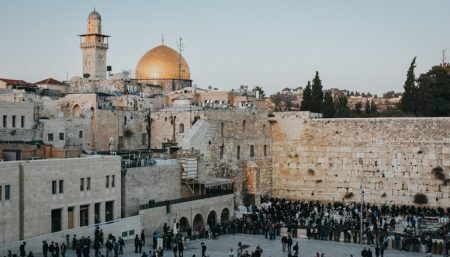 We are able to peer down over the walls of Jerusalem’s Old City and on to the many famous sites like the Dome of the Rock on Temple Mount with its iconic gold colored dome. As we descend the Mount of Olives we can see the Garden of Gethsemane, the Church of All Nations, with its colorful mosaic pediment and the Jewish burial tombs of Zechariah, Absalom, Benei and Hazir. We pass through the Kidron Valley and follow the walls of the Old City until we reach the Zion Gate and the entrance to the Armenian Quarter. We walk along the Cardo, the restored main Byzantine street which ran through the Old City. The stone openings lining the Cardo once housed Crusader shops and today they hold up-market modern stores. The restoration and excavation of the Cardo is not yet complete and we can see the various stages of this process. We arrive in the Jewish Quarter at the Western Wall (the Kotel or Wailing Wall) it is the last remaining retaining wall of the Temple Mount where the Jewish Temple stood – the Second Temple was destroyed in 70AD. Here Jews gather at all hours of the night and day to pray. You can place a prayer note in the cracks between the huge stones of the wall. Our next site is the Via Dolorosa or Way of the Cross. This was the route Jesus took, carrying his cross towards his crucifixion. The Via Dolorosa winds its way through the Old City lanes and markets, each of the 14 Stations of the Cross where Jesus paused are marked with an explanation of the events. We reach the last point on this holy route at the Church of the Holy Sepulchre, constructed on the site where Jesus was crucified at Golgotha. The huge church has several beautifully adorned chapels and within the church are five of the Stations of the Cross – the 10th where Jesus was stripped of his clothes; The Chapel of the Nailing of the Cross (11th station); The Rock of Calvary (12th station); the 13th station where Jesus’ body was removed from the cross and the place where Jesus was laid to rest in his tomb (14th station). On our way out of the Old City we pass through the Christian Quarter and the Muslim Quarter markets where you can buy souvenirs, bargain over your purchase and taste delicious freshly squeezed orange juice. Then we leave Jerusalem and head south towards the Judean Desert. Our journey takes us passed the Biblical city of Jericho and further south to the Dead Sea. On the way through the desert we pass the mark which indicates that we are going beneath sea level; the Dead Sea is the lowest point on Earth at about 400 meters below sea level. After an exciting day of sightseeing we can relax with a swim in the famous sea. The Dead Sea is 9.6 times saltier than the ocean and the high saline content will keep you afloat so you can pose for a classic shot reading a newspaper. Give yourself a natural spa treatment by covering your skin with the black Dead Sea mud, then head back into the water for the complete Dead Sea swimming experience. Guests will have approximately 1.5 hours to enjoy at the Dead Sea. Guests should bring their own lunch OR purchase lunch for $15 online at the time of booking. Changes of vehicle is required to save time and avoid traffic and delays! What to bring and wear: Modest dress is required for holy places, passport, comfortable walking shoes and water. Bathing suit, towel, hat, sun protection and flip flops are required for the Dead Sea.